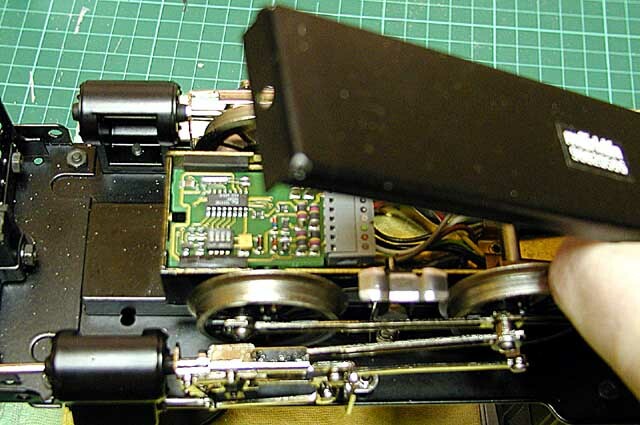 This was originally written in 2008 as a forum post for the now defunct G Scale Mad forum. Appologies for the basic formatting of this page, I've simply inserted enough html tags using Notepad to get it to work! Something a little different to the usual LGB, Aristo & Bachmann etc. locos we normally see on the forum: This is a Maerklin MAXI loco that I particularly wanted as it’s named in honour of my long-suffering wife who has put up with me filling our house with trains of all sizes over the last 20 years! It’s of quality metal construction, basic details and toy-like with exposed screws etc. but beautifully made and runs superbly. It doesn’t look too bad against small LGB locos like “Chloe” and “Olomana” except for the obvious scale difference in the cab area. I think the average LGB engineer will have a bit of trouble getting on board! 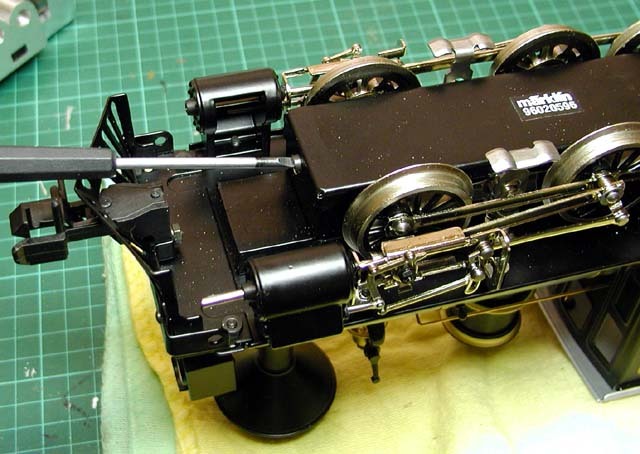 I would expect other MAXI locos to be of similar general construction with regard to fitting a DCC decoder. 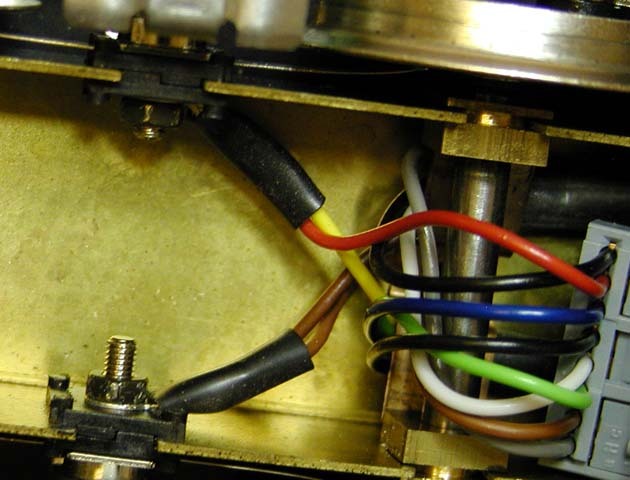 Access to the chassis cavity and wiring is via removal of a cover plate, secured with a single screw at one end and a lug at the other. 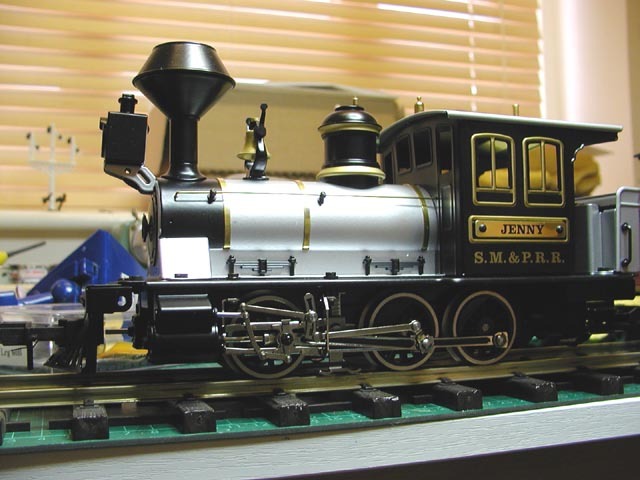 The loco comes fitted with a Maerklin Delta decoder (not DCC compatible). 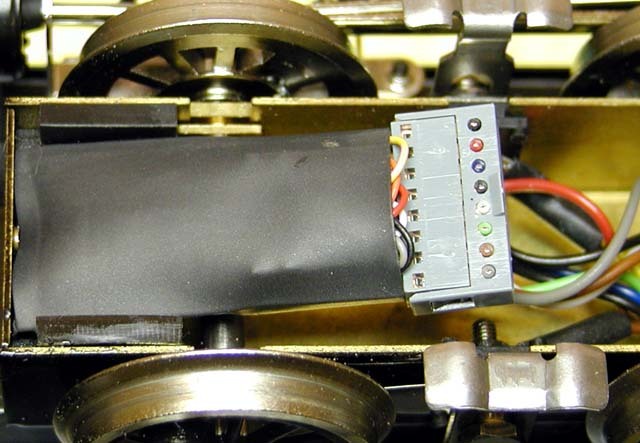 The decoder is supported in a plastic mount and slides backward to remove. ... and is also provided with a DC blanking plate for analogue use. Note: the smoke unit is wired direct to track power via a switch in the cab. Fine by me, I left it as-is! 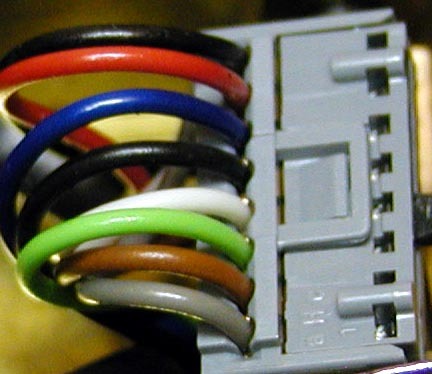 (You can see two wires to each track connection, one brown and one yellow don’t go via the 8 pin socket – these are the smoke unit wiring). 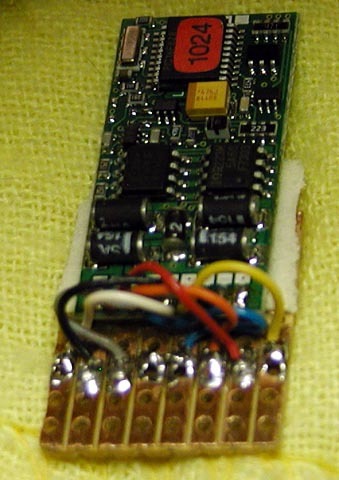 Strips #4 and #5 were simply linked together using a blob of solder. 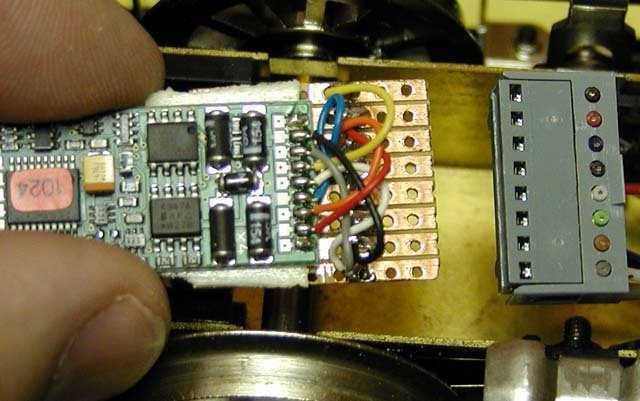 The mounted decoder was then plugged back into the socket. 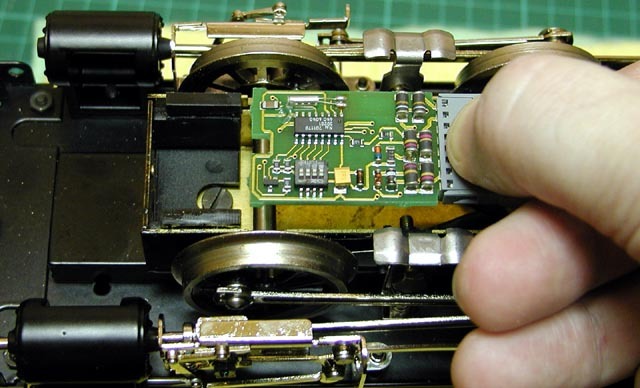 You need to be sure the decoder is isolated from the metalwork of the chassis. 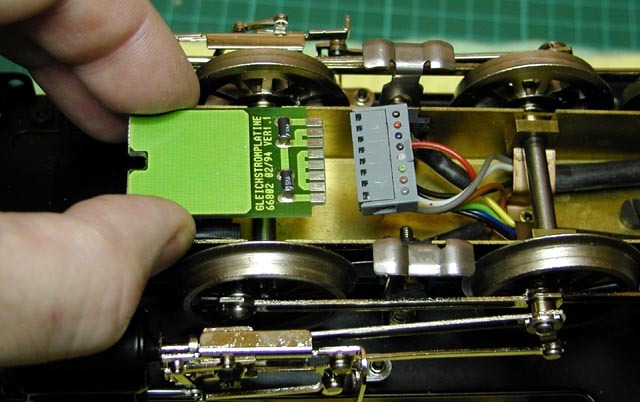 Insulation tape will probably do fine, but I was fortunate to have available a dedicated decoder sleeve supplied with a recent Hornby OO loco, which fitted perfectly. (Might have to go in search of more of these sleeves as they’re very useful!) Site the decoder nicely in the chassis where the old Delta decoder lived, replace the cover plate and Job Done!